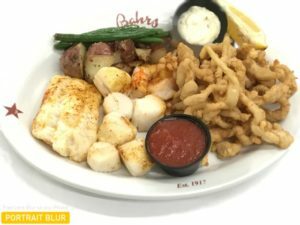 Our lunch menu features traditional Jersey Shore seafood diners including broiled flounder, cod, shrimp. Fried clams, oysters, strip clams. All served with famous home made Cole slaw and buttermilk biscuits. Lobster Roll, crab cakes, and soft shell crabs, are favorite sandwich options at Bahrs. Don’t forget our whole belly fried clam roll Ipswich style. Also we have non seafood items such as Burgers, prime rib dip and salads. Steamer, and our raw bar available at lunch. For those who desire larger portions, our Dinner Menu is available all day starting at 11:30.